Our 10 latest entries are shown below - most recently added are shown at the top. A wide variety of gardens will be open, ranging from a small garden full of surprises, a deceptively sized walled garden, informal country gardens, a varied and colourful ...... cont. Gardens in the village of Stone-in-Oxney will be opened to the public either for the first time since 2006 or for the first time ever. There will be a wide variety of types of ...... cont. Wiveton is a special gem of a village between Blakeney and Cley on the North Norfolk Coast. 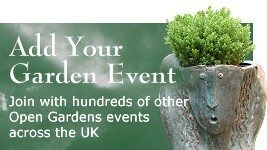 We are having a one-off afternoon when we will be opening gardens large and small ...... cont. Your chance to enjoy a range of inspirational gardens around Charlbury, plus teas, cakes, raffle, quiz for children, sculpture trail, and more. Austwick is a very pretty Yorkshire Dales village with a range of gardens for you to enjoy. There is a huge variety to admire - small, large, perfectly manicured, works in ...... cont. This is truly a village event, organised by the Mulbarton Allotment and Leisure Gardeners' Association. Gardens large and small with unique and diverse characters will be on ...... cont. Our very first Open Gardens event. Be surprised by our lovely hidden gardens. Refreshments and home-made cakes available. 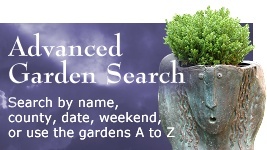 A wide variety of gardens to view from well established to relatively new. Teas and cake will be served in the Parish Hall next to the church. Visit our Mediaeval church and wander around our charming village, with lovely, varied gardens from cottage to formal. Ploughman'’s lunch, teas and homemade cakes. Book stalls. Beautiful cottage gardens hidden and tucked away in this picturesque coastal village. 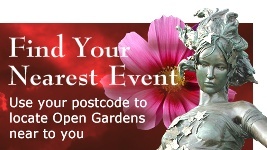 Gardens open whatever the weather. Bring umbrellas and suitable footwear if ...... cont.